Sandwiched between the swim with sharks and the run or stumble to the finish line, the meat of the triathlon is the bike ride. 7 weeks into my triathlon training, it was high time I tried the meat out. The very day that I’d signed up for Bribie, I had got onto EBay and purchased a padded gel seat from China to put over the existing bike seat. Because frankly it is beyond me how any female can spend any amount of time on a bicycle without extra padding. Once my tri suit arrived, I found that it also has a small built-in pad, like a nappy but way cool because it is a triathlon nappy. I’m still not sure if double bum protection will suffice; I may invest in a pair of padded cycling shorts, to slip over my tri suit for the bike portion of the race. To be honest, I am even considering doing the whole thing standing on the pedals (it’s only 6km) although this would hardly stand me in good stead to decide if I can do a long triathlon or not. It will be tricky to control my bike (aka Shane’s bike) on unfamiliar roads with lots of other cyclists crowding around me, trying to overtake, and possibly crashing in front of me. Slow cyclists really annoy fast cyclists in triathlons. I am going to annoy everybody, which scares me. The roads may or may not get slippery from the thousands of other bikes and heat of the day, combining to create the effect of banana skins over the whole course. You need to carry a CO2 tube and repair kit to fix any flat tyres you get on the track. I’m wondering if I can just pull Shane along in a little trailer behind my bike to do this crap for me. Triathletes have to get to grips with changing gears, because being in the right or wrong gear can make or break your race. I have never changed gears on a bike in my life and hope that it’s exactly like changing gears in a car. There is this thing called ‘drafting’ which is where you cycle behind someone in their tail wind, apparently making it easier for you, which means drafting is totally illegal in triathlons (where anything easy is scorned, shunned and SHUT DOWN). As I expect to be dead last by the start of the bike portion of the race, I have been having visions of myself accidentally ‘drafting’ behind the entire rest of the pack. Which I’m pretty sure will result in course marshals throwing rotten eggs at me to make me stop so that they can disqualify me. After which, I guess they will hit me up with a restraining order that will mean I wont allowed within 100 metres of a triathlon course for the rest of my life. Stupid Google, stuff you and your scare tactics. I think I’ll stick to looking things up AFTER I fail. For now, I just need to make sure I can cycle 6km and stay on the bike. I ventured into the darkest depths of the shed, where the bike has slept untouched for almost 7 years. A relic from Shane’s carefree and single days, the bike still has an aura of youthful optimism and joy about it which I liked immediately. Also, underneath all the dust and cobwebs, the bike is blue and matches my tri suit and helmet. It was just meant to be. The wheels were flat, the gears rusty. A family of spiders were living in the crevice on the seat. Goodness knows what was living in that mess on the front brake pads. But I was pleased to know the name of the brake pads. I silently congratulated myself, and felt sure that this cycling stuff might save me. 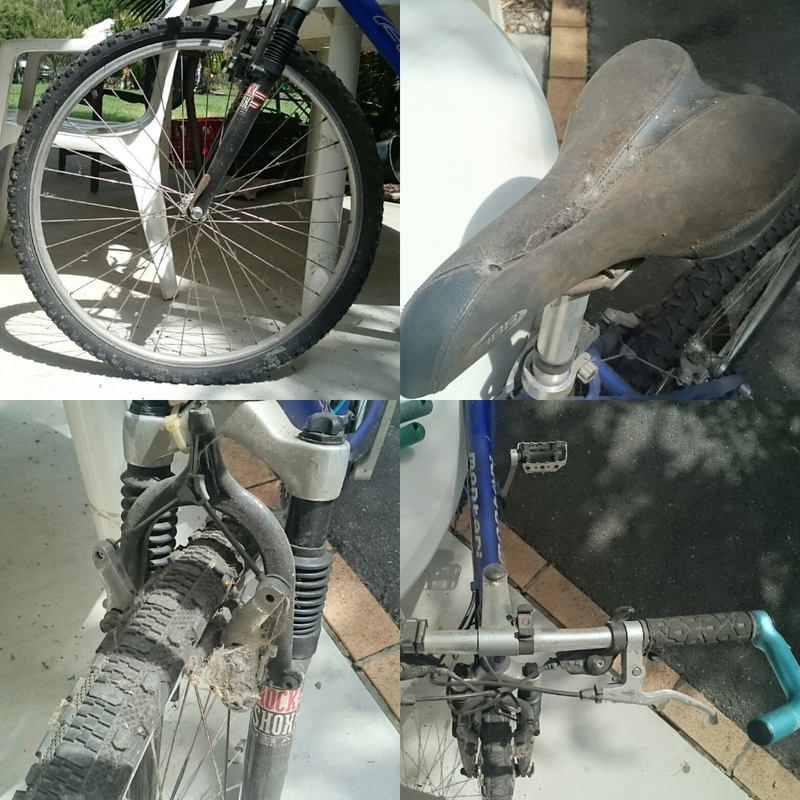 I set about cleaning each centimetre of the bike with a rag and soapy water as lovingly as possible, to convince the bike I am a friend, not an enemy. It took ages, but eventually she shone like a beautiful blue horse. Shane pumped up the tyres. Off I went, on my first bike ride. Your bum still hurts 4 hours later. Somebody get me a beer. 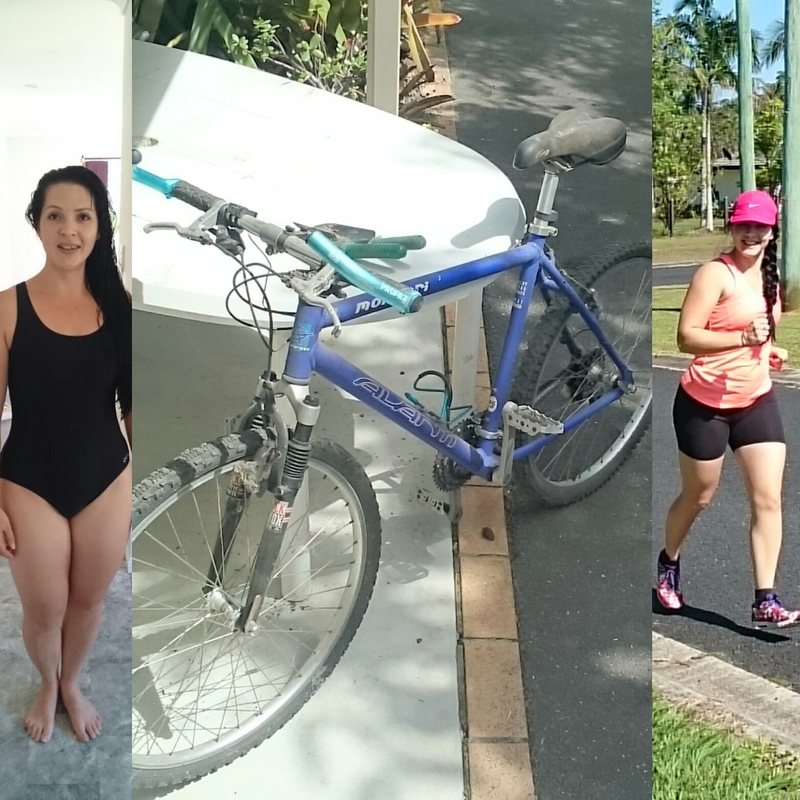 This entry was posted in Show Me Bike and tagged beer, bribie, cycling, drafting, mountain bike, spiders, training, triathlon. Bookmark the permalink.